Urban Matter from ICA North America can be applied and massaged to give the impression of textiles, fabrics and other tensile surfaces. Finishes are mostly fluid, and so is the nature of the cabinet and furniture coatings industry. 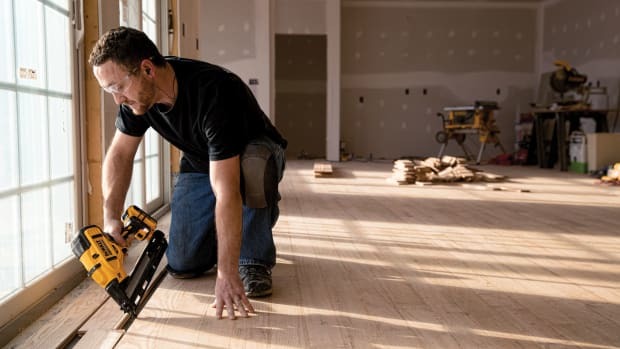 Here, technology is constantly evolving, in part thanks to innovations from the automobile and hardwood flooring industries, and also because of new chemistry, improved pneumatics, and the global growth of technical knowledge. But most of the big changes happen within the industry. Take, for example, what happened in Pittsburg on Jan. 30. Industry giant PPG (ppgindustrialcoatings.com) announced the opening of a wood coatings research and development lab at its Springdale, Pa., facility. The lab is dedicated to developing industrial coatings for wood products, and to that end it employs chemists, technicians and color stylists who are supported by the latest application, mixing, testing and analytical technology. Among the technical emphases for the laboratory are ultra-violet(UV)-cure coatings, which emit virtually no volatile organic compounds (VOCs) when applied; waterborne and solvent-borne coatings; and specialty products such as electro-beam(EB)-cure coatings and ink resins for resilient flooring. PPG has more than 100 years of experience in the wood coatings industry, a longevity that is perhaps due to forward-thinking moves such as this new lab. 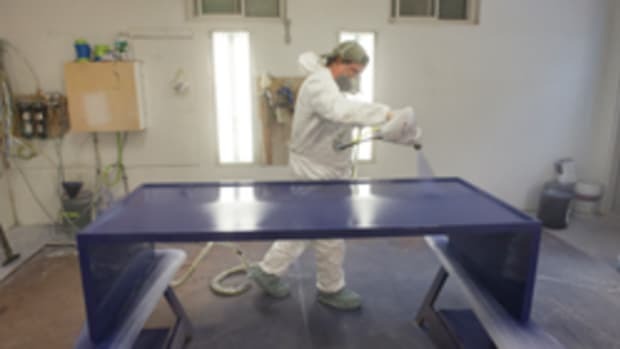 The company manufactures toners, primers, stains, fillers, sealers, glazes and topcoats. Globally, one of the more unusual recent evolutions in topcoating is the manipulation of other gases for the air in pneumatic delivery systems. 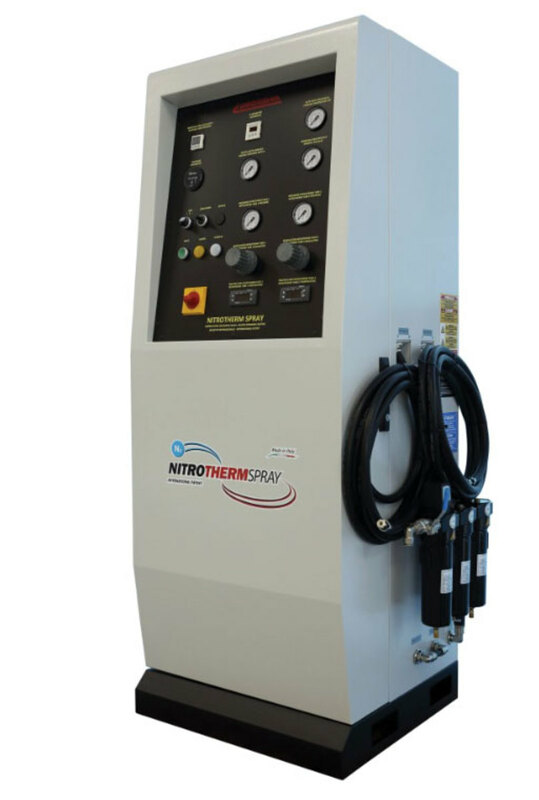 One of these is Nitrotherm Spray, a coating for wood and carvings that uses spray guns to deliver a mix of air and heated nitrogen, developed by Eurosider (eurosider.com), a manufacturer in Grosseto, Italy. Among the advantages of coating wood using this technique are that less material is sprayed; more paint adheres to the wood; there is almost no material dispersion in the environment due to ionized nitrogen (which eliminates the electrostatic particles from wood); a shorter drying time is required for carved materials and complex surfaces; and it also takes less time to spray the coatings. Eurosider’s delivery system mixes air with heated nitrogen. Some technologies help with cost. Axalta (axaltawoodcoatings.com) supplies varnishes, glazes, stains and lacquers that are available in ultra-low VOC and HAPs-free, formaldehyde-free and isocyanate-free formulations. 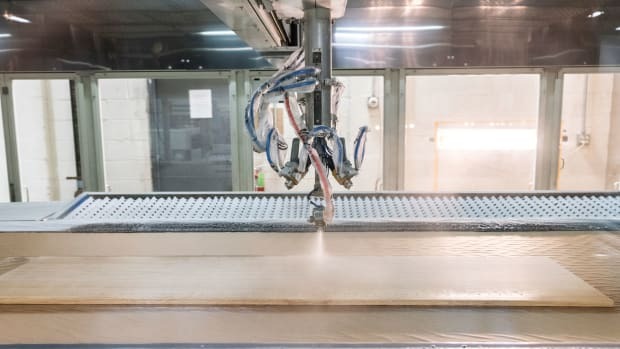 Its wood coating lines including Zenith, Ultraguard, Lifeshield, and Color Choice, and last fall, the company expanded its industrial Tufcote product line with Tufcote Hydro 2.1 HG, and Tufcote Hydro LV HG waterborne acrylic products. The new collection of waterborne coatings is formulated to meet the demand for economy industrial products, and may be used on wood surfaces. 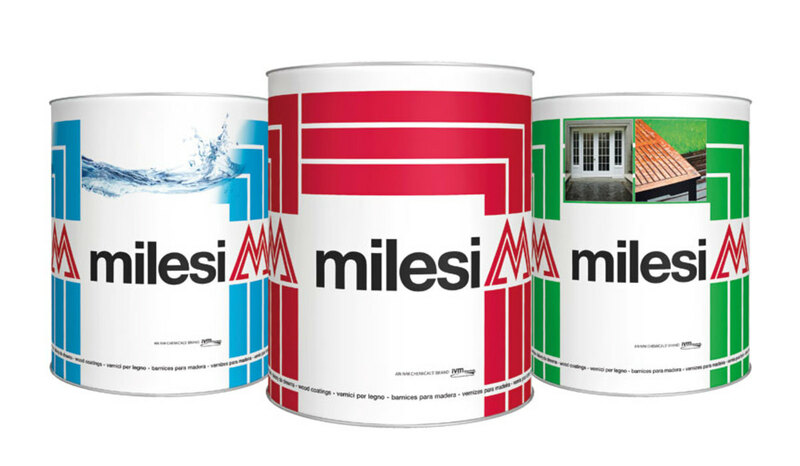 Milesi is a brand of the IVM Group, which is one of the largest and most influential wood coatings manufacturers in the world. It is leading a movement, born in Europe and now gaining serious ground in the U.S., that changes the standard coating from conversion varnish to 2K urethanes where the catalyst is in a separate container. Rubio Monocoat (rubiomonocoatusa.com) in Spicewood, Texas, is known for its oil finishes that offer natural ingredients. 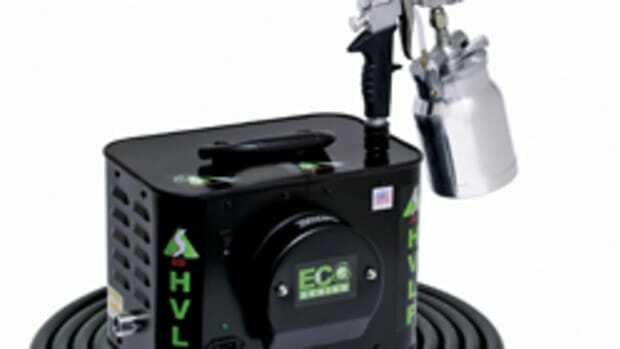 Now the company has launched LED Oil, which is cured by running coated product under a bank of LED lights. It is available in 40 standard colors, looks and feels more ‘natural’ than many other coatings, offers easy maintenance and can be cured in the woodshop, on the jobsite and even with a hand-held dryer. LED Oil is suitable for flooring, furniture, stairs and other hard to reach areas, according to the company. 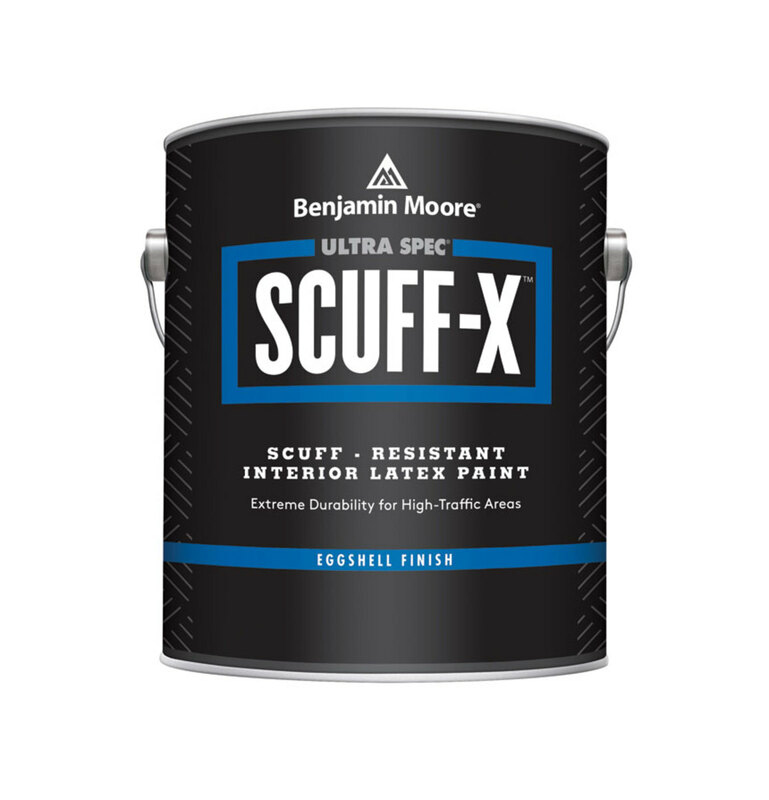 In these days of painted casework, where Houzz recently reported that almost half of new cabinets come in white, woodworkers will find it interesting that Benjamin Moore & Co. recently introduced Ultra Spec Scuff-X. The company describes it as the first-of-its-kind, one-component interior latex paint engineered specifically to resist scuffmarks in high-traffic, commercial environments. “Our proprietary scuff-resistant technology minimizes repainting, retouching and cleaning, while offering easy application, low odor and quick dry-time,” said Alfredo Valiente, Benjamin Moore’s brand manager. R&D Coatings (rdcoatings.com) in McKees Rocks, Pa., started out making solvent-based coatings, and today offers water-based and UV finishes. It now offers UV industrial wood stains that maintain a consistent color during production runs, according to the company. And woodshops that are unable to stain wood, but would like to change the shade or color of a product, can use R&D’s UV curable Toned Top Coats to accomplish that. 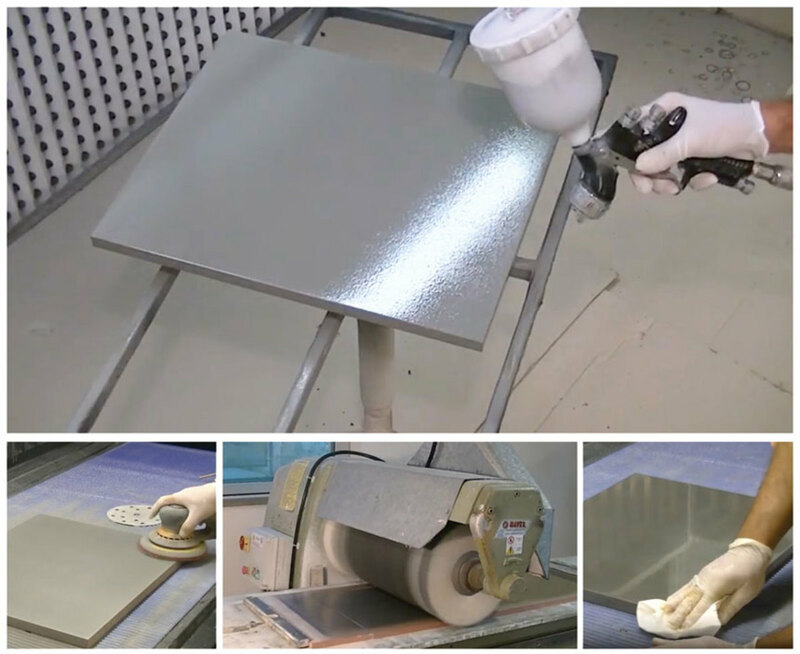 Rubio Monocoat’s LED Oil is cured with LED lights, a process that can be accomplished in the shop or on the jobsite. Formaldehyde has been a challenge for the coatings industry for a long time, but manufacturers around the world have made a stand of late. A good example is Renner Wood Coatings (rennerwoodcoatings.com), which began manufacturing in Charlotte, N.C., in 2012. Its research facility in Italy employs 46 chemists who have turned much of their focus on formaldehyde-free coatings. Formaldehyde has traditionally been used in this industry as an antibacterial, anti-fermentation and anti-mold solution, but it is also toxic. According to Renner, concentrations of the chemical may cause respiratory and eye irritation, especially in asthmatic or allergic individuals, and it is lethal if swallowed or inhaled in large quantities. 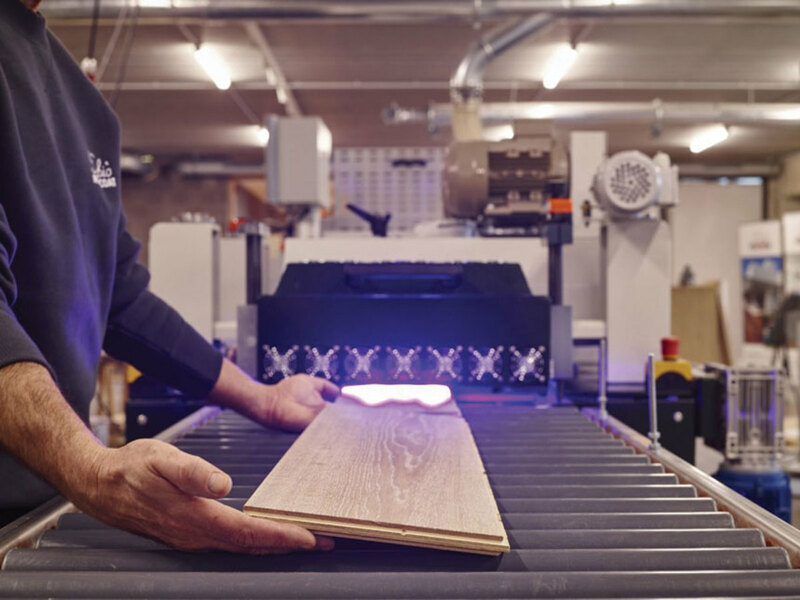 Renner Italia decided to eliminate formaldehyde and its parent compounds from its water-based coatings, and its wood coatings are now completely formaldehyde free. Another company worth watching in the field of research is Verylak (verylak.com), a new player that was formed by Canlak, DAAS & Partners, and Verinlegno. Based in Lewisville, N.C., it combines North American and EU technologies, and has labs in both Canada and Italy. Products include solvent-based lacquers and varnishes, water-based products, UV coatings, products low in VOCs, polyesters and polyurethanes. Another company with strong Italian roots is Ontario-based ICA North America (icaamerica.biz), which imports water and solvent stain systems, 2k solvent-borne polyurethanes, polyesters, and some of the very latest water-borne products. 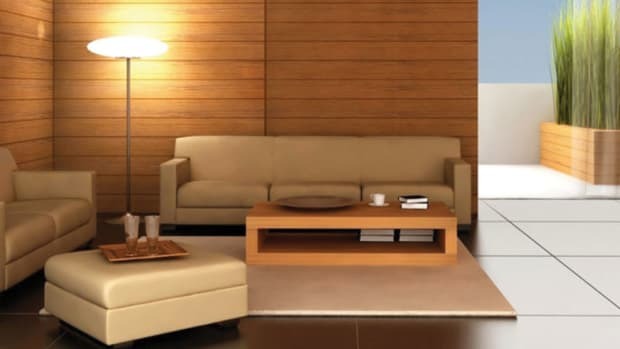 Its new Urban Matter range of wood coatings has a distinctively metropolitan feel. It’s composed of high-impact, material-like effects that give the impression of textiles, fabrics and other tensile surfaces. AcromaPro, from the Sherwin-Williams Co., offers AccuStain in a combination of 16 alkyd colorants and three clear mixing bases. The mixing system provides clean, rich colors and has soft settling characteristics for color consistency. And the spray version, AccuStain Spray Stain, also offers a combination of three solvent blend formulas as a guide to formulate spray (no wipe) bases for interior woodwork. These suggested solvent bases “are for high production shop applications where line efficiency is critical in allowing the operator to spray without further manipulating the stain with a rag,” according to the company. These spray stain formulas provide a softer appearance compared to standard wipe stain applications and can be customized to fit line requirements. Mid America (midamcoat.com) offers a full line of solvent- and water-based UV coatings for wood, including urethanes, acrylics, two component and self-crosslinking systems. The solvent-based products include pre and post-cat lacquers and conversion varnishes. The company’s UV 1010 tint-able clear UV coating for wood can be applied with a spray or vacuum system and meets or exceeds all KCMA standards. And Teknos (teknos.com) has built a brand new technology and training center in the company’s Rajamäki facilities in Finland. The facilities also allow the company to test its own products before commercializing them, and do so in the circumstances where they will be used. M.L. 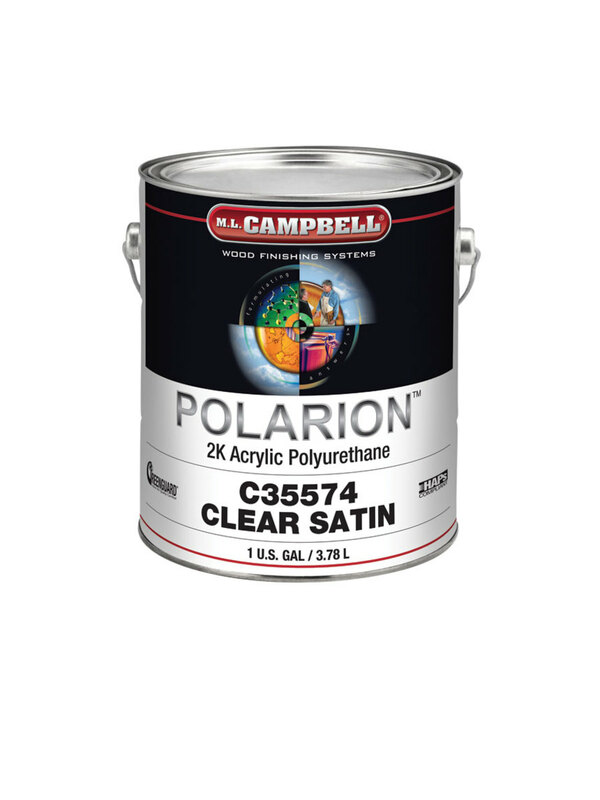 Campbell (mlcampbell.com) introduced the Polarion 2K acrylic polyurethane system, consisting of sealers, primers, and clear and pigmented topcoats with a full range of sheens, all using just one catalyst and mix ratio. This simple combination makes it ideal for use on large surfaces such as conference tables and bar tops, or any interior wood surface that requires a hard durable finish, according to the company. M.L. Campbell has also introduced Agualente Plus, a waterborne pre-cat that is a one component, VOC compliant system that provides a hard, durable, stain resistant finish for interior wood surfaces. General Finishes in East Troy, Wis., was founded in 1928 by a Milwaukee lumber company to make finishes for its cabinet-shop customers. The company has a very intuitive guide to its topcoats on its website, generalfinishes.com. IC&S (ics-ilva.com) handles a wide range of products from the Italian supplier Ilva. Included are interior and exterior waterborne systems, UV cured finishes, polyester, polyurethane and acrylic urethane systems. BTD Wood Powder Coating (btdwoodpowdercoating.com) in Brainerd, Minn., is a manufacturer of powder-coated wood components, and has been coating MDF since 2002. Integra Doors in Greenville, S.C., offers powder-coated MDF custom cabinet doors and moldings, and the company presents a pretty good argument for going this route. 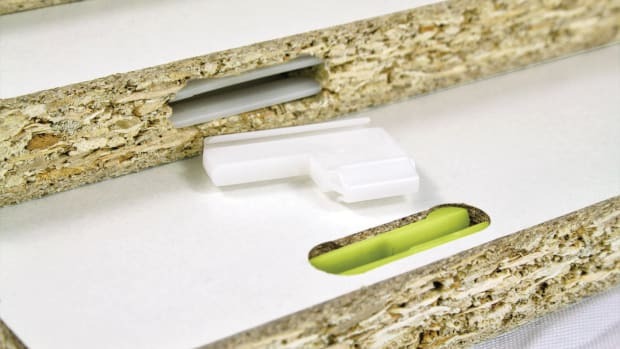 A page on its website, integradoors.com, describes in detail the process whereby custom MDF doors are coated with epoxy powder and an acrylic binder and then heated, which causes the powder to gel and flow, bonding to the surface and completely sealing the piece. Another significant player in the powder-coated wood field, DVUV (dvuv.com) in Cleveland, makes finished parts to order, providing turn-key production from initial drawings to finished parts. 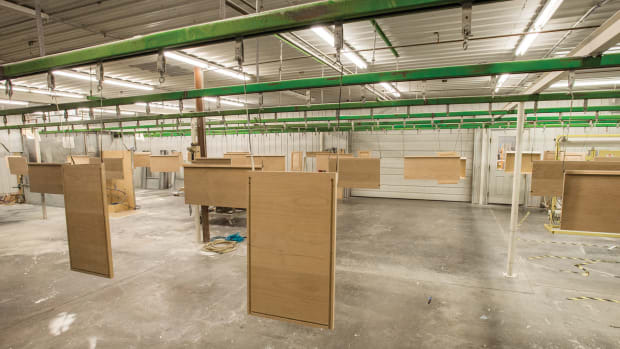 Once a shop sends drawings and finish specs to the company, it works with a network of MDF mills and CNC machining companies to source materials and finish them in its UV powder coating facility. Its UVMax brand is a UV-cured powder coating that flows smoothly over contoured shapes, edges and 3D surfaces. Gemini Coatings (gemini-coatings.com) has locations throughout the U.S. and offers a complete line of wood finishing products and support materials including conversion varnishes, pre-catalyzed lacquers, stains, touch up and repair products, primers and sealers, urethanes, acrylics, waterbornes, and exterior wood stains in its TWP product family. Old Masters pays homage to the current trend toward gray floors with two new colors, Aged Oak and Weathered Wood. There are samples of these on various wood species on the website, myoldmasters.com. Unearthed Paints (unearthedpaints.com) has changed the name of its main wood finish to Naked Floor Hardwax Oil. The product is mostly used as a floor finish, providing a natural alternative to polyurethane, and it can also be used as a hard finish on furniture. For every applied square foot of its oils, paints and plasters that are purchased, the business buys one square foot of rain forest and donates it back to indigenous peoples. Some coatings are designed for endurance, and nothing tests that more than a maritime existence. Bristol Finishes (bristolfinish.us) was originally founded in Virginia Beach, Va., to create solutions for boat owners. The company’s Classic Clear Water Based Urethane is a ready-to-use, self-activating urethane finish. CCI/FinishWorks (ccifinishworks.net) has locations throughout North America and its Aristo Shield product is designed to make a finish more resistance to scratches and marring. For woodshops using clear coatings, Howard Products Inc. (howardsproducts.com) in Paso Robles, Calif., offers a range of products designed to protect and enhance and preserve them. Those include Restore-A-Finish, Restore-A-Shine, SunShield, Cutting Board Cleaner, a butcher-block conditioner, paste wax and other polishes. And shops with an interest in achieving a traditional shellac look may want to take a look at Royal-Lac from ShellacFinishes (shellacfinishes.com) in San Diego. This post-cat wood finish delivers the look and feel of shellac with quick curing, high solids and low levels of VOCs. 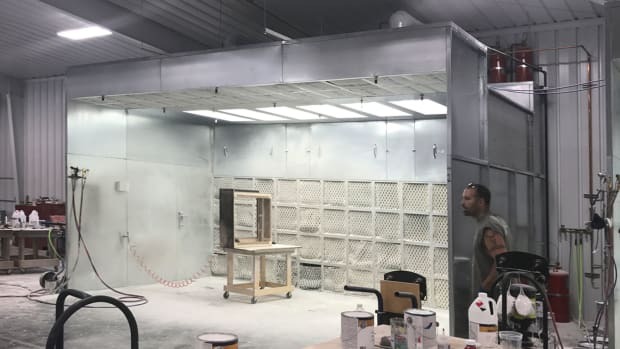 Powder coating equipment is moving into more and more woodshops because MDF’s density and uniform surface are so well-suited to the technology. 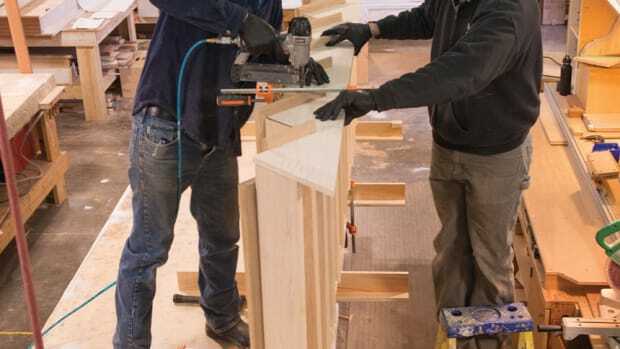 There are more than 40 brands of finish nailers on the market, and most manufacturers offer several models.